A paraglider is a free-flying, foot-launched aircraft fitted with a harness suspended below a fabric wing. To fly, all you have to do is spread out your wing (a lightweight canopy) on a hillside and run until the wing inflates over your head like a kite. Once you’re airborne, you’ll float through the sky, like a dust moat on a lazy day, powered by upward air currents. 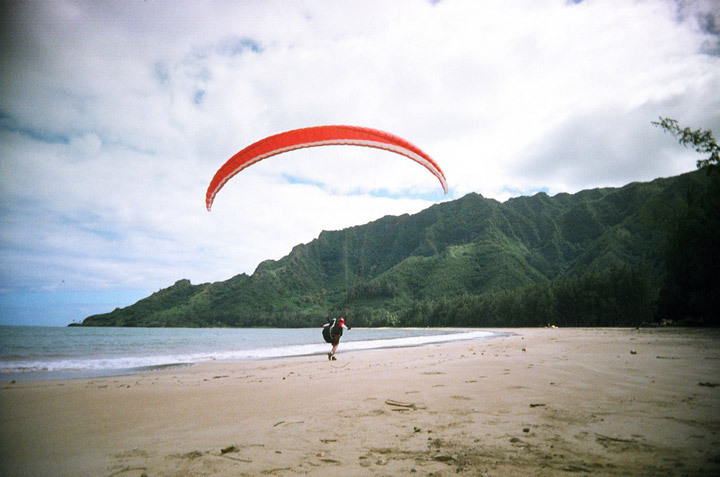 Most paragliding is done on the slopes of Haleakala with descents ranging from 1,000 to 3,000 feet. If you’re a beginner, you may be able to reserve a tandem flight. Considered the best way to learn, tandem paragliding pairs a certified instructor and a student pilot in the same glider. The instructor launches the glider. Once airborne, the instructor will teach the student pilot how to control the aircraft. Landing the tandem is generally easy. The pilot steers the paraglider into a nice glide path into the wind and comes down for the landing. Paragliding originated in the Alps in the early 1980s as a climber’s descent technique. Enthusiasts say the sport is the easiest and safest form of personal flight known to man.